See some snaps full of fun and frustration when much of Britain came to a standstill in the grip of arctic weather. Abandoned cars are left on Reigate Hill near Reigate, Surrey, as large areas of Britain were brought to a halt today as the big freeze tightened its grip on the nation. A stranded passenger sleeps on a luggage check desk at London's Gatwick airport, Horley, England, Wednesday, Dec. 1, 2010. Snowboarders and skiers enjoy the snow at Boxhill in Surrey, as large areas of Britain were brought to a halt today as the big freeze tightened its grip on the nation. Abandoned cars and a bus are left on Reigate Hill near Reigate, Surrey, as large areas of Britain were brought to a halt today as the big freeze tightened its grip on the nation. 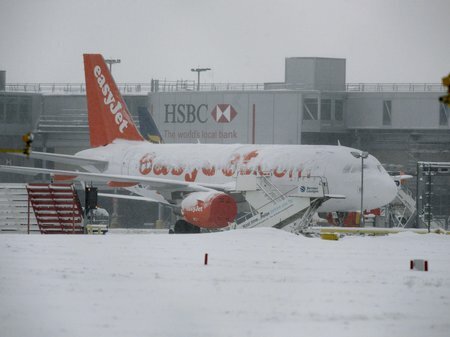 Edge markers are seen on a snow covered runway at London Gatwick airport, Horley, England, Wednesday, Dec. 1, 2010. A woman carries a snow shovel as she walks along a snow covered road near Farningham, Kent, as large areas of Britain were brought to a halt today as the big freeze tightened its grip on the nation. A lone truck driver makes his way northbound on the M20 near Farningham, Kent, as large areas of Britain were brought to a halt today as the big freeze tightened its grip on the nation. Traffic on the the M25/M20 interchange in Kent, as large areas of Britain were brought to a halt today as the big freeze tightened its grip on the nation. A sheep in the snow near Ashford, Kent, as large areas of Britain were brought to a halt today as the big freeze tightened its grip on the nation. A man clears snow from a car near Swanley Village, Kent, as large areas of Britain were brought to a halt today as the big freeze tightened its grip on the nation. A man prepares to abandon his car on the A20 near Swanley Village, Kent, as large areas of Britain were brought to a halt today as the big freeze tightened its grip on the nation. Commuters in the snow at Leytonstone tube station in East London on Tuesday morning. Highland cows make their way through the snow during feeding time at Craigannet Farm near Carronbridge Central Scotland, as heavy snow continues across the country. Gemma O'Neill enjoys the snow in Holyrood Park in Edinburgh as snow continues to fall across the UK. A snow plough clears a road in the village of Edlington near Alnwick, Northumberland, as heavy snowfall continues across the North East. A lioness eyes up a Robin red breast in the snow at Blair Drummond Safari Park. Roads around Newcastle were blocked by deep snow today following another night of heavy snowfalls. A man digs his car out in Monkseaton, Newcastle, as heavy snowfall continues to cause travel chaos. A snow plough clears a road in Alnwick, Northumberland, as heavy snowfall continues across the North East. Alicja Wdowiak throws snowballs for her dog Logan and Maya, in Dalby Forest, North Yorkshire, as more snowfalls are forecast along the east coast of the UK. Gridlock on the A1 in Newcastle as the Met Office issued severe weather warnings, flagging up icy roads and drifting snow for the eastern side of the country as well as parts of Wales and Northern Ireland. A Bukhara stands in the fresh snow at the Highland Wildlife Park near Aviemore in Scotland, after snow hit the UK. A snow covered Victoria Park in Aberdeen, Scotland. Snow covered beach huts in Filey, North Yorkshire, as more snowfalls are forecast along the east coast of the UK. Snow causes problems for farmers in Huntly, Aberdeenshire, Scotland. Motorists battled with hazardous conditions on the roads as the widest-spread November snowfall for 17 years gripped the country. Parts of the UK were blanketed in white as many woke to wintry scenes and freezing temperatures following a bitterly cold night. A man walks through deep snow near Castleton, North Yorkshire. Snow falls in a street in York, as the Met Office issued severe weather warnings. A wintery scene in Blaydon, Newcastle, as the Met Office issued severe weather warnings, flagging up icy roads and drifting snow for the eastern side of the country as well as parts of Wales and Northern Ireland. Snow lies on the ground near Inverurie, Aberdeenshire, Scotland. Blizzards in York make the ride home from work uncomfortable. A terraced street in Gateshead looking across the Team Valley as thick snow blanket the North East. Dog walkers brave the snowy conditions in Aberdeen as the cold snap hitting the UK continues.